Efficiently handles pipe, tubing, and bar stock. Adjustable arm assemblies slide along center channel and extend out to 12' to handle different sized material. 3" channel steel arms include support bars welded at an angle for maximum support. 5,000-lb. capacity overall. Channel steel deck is covered with heavy gauge sheet metal for increased strength and durability. 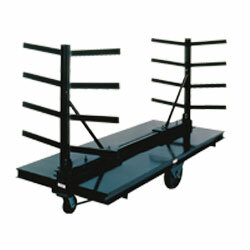 12" x 3" plastic wheels and 6" x 2" swivel casters are mounted in an efficient diamond pattern. 94"L x 38"W x 39"H overall. Color: gray. Other colors available, call for information. FOB MASSACHUSETTS.